For international customers email info@bmobooks.com.au to see if you are eligible for the $7.00 postage rate for purchase of a single pair of these Swimwear. Unfortunately the website doesn't automatically apply the discount please email to apply. 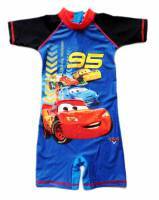 Size 6 Disney Cars one-piece rashsuit. This swimsuit is great for all Disney Cars fans. It is practical, colourful and provides great sun protection. ■ Available in 2 different designs. See alternative Cars Swimsuit design. Swimsuits are often made in small runs, so you might want to consider a larger size than you would normally buy. This Disney Cars Swimsuit is also available in Size 2, Size 4, Size 8, and Size 10.